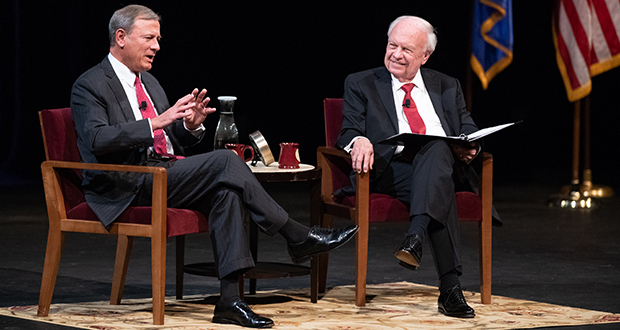 Chief Justice John Roberts, left, speaks during his conversation with former University of Minnesota Law School Dean Robert Stein on Tuesday at Northrop Auditorium in Minneapolis. Then he assured the crowd that the court would continue to act to the best of its abilities whether times are calm or contentious. Roberts and Robert Stein, the founder of the Stein Lecture Series, former U of M law school dean and chief operating officer of the American Bar Association, then settled in for the traditional question and answer format of the lectures. Stein first asked about the difference between the roles of the chief justice and associate justices. “The most important difference is that I get an $10,000 extra per year,” Roberts replied. He went on to explain that works out the opinion assignments so that justices have a mixture of opinions to write, “Including the cases that we call ‘the dogs.’” He said that it was a process he enjoyed. “It’s like a riddle or a puzzle to get everything to fit together,” Roberts said. Additionally, sometimes a justice has to explain his or her position on legal doctrine to a new justice and that causes the justice to re-examine it, Roberts said. Stein asked Roberts if he was bothered by observers’ criticism of the court and how he dealt with it. “I try not to read it, frankly,” he said. “The good thing about life tenure is that it doesn’t bother me that much.” He added that he did read articles about the court that he thought would provide thoughtful analysis, including the Supreme Court press corps’. The audience for his opinions is his three sisters, Roberts said. They are not lawyers, they are not in Washington, D.C., they like to keep up with civic affairs but are not preoccupied with them. “I would like somebody in that position to understand what their Supreme Court has done,” the chief justice said. “I think sometimes the lawyers are disappointed that I didn’t chase every rabbit down every hole. Certainly the law professors think that,” he added.